Beautiful inside and our, these elegant compact mirror favors are something special to behold! 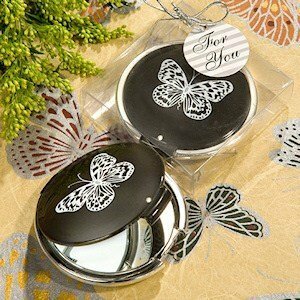 The shiny black plastic compact measures 2 1/2" round and is accented with a detailed white butterfly design with sparkling rhinestones. The hinged lid opens to reveal a dual-sided mirror interior. Packaged in a clear gift box and tied with a silver bow, the favor is finished with a silver and white "For You" tag.